From wiki:Banyuls-sur-Mer is neighbored by Cerbère, Port-Vendres, Argelès-sur-Mer and Collioure. The region is known for its wines, such as the sweet wine Banyuls. An aquatic museum with aquarium is located in the town. The foothills of Pyrenees, the Monts Albères, run into the Mediterranean Sea in Banyuls-sur-Mer, creating a steep cliff line. 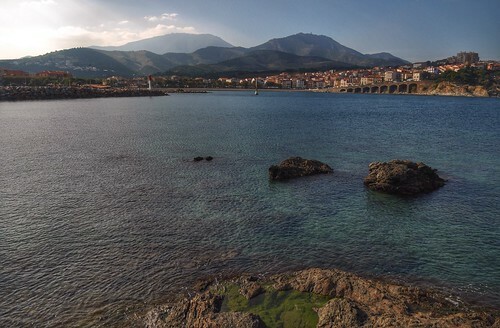 Banyuls-sur-Mer was first mentioned in 981 as Balneum or Balneola. In 1074, the town starts being called Bannils de Maritimo in order to distinguish it from Banyuls-dels-Aspres, which lies 20 km (12 mi) away. In 1197, the town is mentioned as Banullis de Maredine and in 1674. In Catalan, it has been called Banyuls de la Marenda, since the 19th century. The name Banyuls indicates the presence of a pond. In fact, a pond did exist in Banyuls-sur-Mer until the creek Vallauria was drained in 1872. The term Marenda in Catalan or sur Mer in French merely indicates the proximity to the coast. For nearly two centuries, the smuggling of goods to and from Spain was a major activity in Banyuls-sur-Mer. Depending on the needs of the time, salt, tobacco, silver, sugar, rice, textiles, and leather were smuggled through this city, almost always with impunity. Otherwise the inhabitants lived mainly from fishing and viticulture. Nowadays, tourism stemming from the wine industry plays a significant economic role in the town notably for delicious and rare red dessert wines. Under the Collioure appellation, the town is also a center of quality dry reds, rosés and whites, with a number of producers of natural wines.